Stay up-to-date on The Paramount Theater’s Bracket Challenge Leaderboard for the 2017 NCAA Men’s Basketball Tournament! The winner of the Bracket Challenge will receive 2 tickets to Paramount Presents: Jack Hanna’s Into the Wild Live, 2 Cinemaniac Passes, and a Paramount Theater Mug! American Bass-Baritone Eric Owens Joined by World Renowned Pianist Craig Terry on April 15! The Paramount is thrilled to welcome Musical America‘s 2017 Vocalist of the Year, American Bass-Baritone Eric Owens on Saturday, April 15 at 8:00PM. To add to our excitement, Mr. Owens will be accompanied on stage by internationally recognized pianist Craig Terry, who has performed with classical titans such as Renée Fleming and Jamie Barton! Lauded for his “sensitive and stylish” (The New York Times) and “superb” (Opera News) playing, Terry has launched an international career regularly performing with some of the world’s leading singers and instrumentalists. Currently Mr. Terry serves as Music Director of The Patrick G. and Shirley W. Ryan Opera Center at Lyric Opera of Chicago after having spent eleven seasons at Lyric as Assistant Conductor. Previously, he served as Assistant Conductor at the Metropolitan Opera after joining its Lindemann Young Artist Development Program. Mr. Terry has performed with such esteemed vocalists as Jamie Barton, Stephanie Blythe, Christine Brewer, Nicole Cabell, Sasha Cooke, Eric Cutler, Danielle de Niese, Joyce DiDonato, Giuseppe Filianoti, Renée Fleming, Susan Graham, Denyce Graves, Bryan Hymel, Brian Jagde, Joseph Kaiser, Quinn Kelsey, Kate Lindsey, Ana María Martínez, Susanna Phillips, Luca Pisaroni, Patricia Racette, Hugh Russell, Bo Skovhus, Garrett Sorenson, Heidi Stober, Amber Wagner, and Catherine Wyn-Rogers. 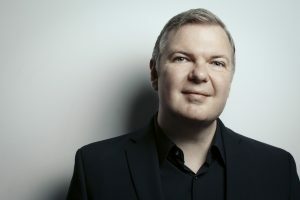 He has collaborated as a chamber musician with members of the Metropolitan Opera Orchestra, the Lyric Opera of Chicago Orchestra, the Gewandhaus Orchester, and the Pro Arte String Quartet. Mr. Terry’s 2016/17 performance schedule includes concerts with Stephanie Blythe, Christine Brewer, Lawrence Brownlee, Joyce DiDonato, Ailyn Perez, Patricia Racette, Hugh Russell, Christian Van Horn, and Laura Wilde. He is Artistic Director of “Beyond the Aria,” a concert series presented by the Harris Theater in collaboration with the Ryan Opera Center and Lyric Unlimited. Mr. Terry’s discography includes three recently released recordings: “Diva on Detour” with Patricia Racette, “As Long As There Are Songs” with Stephanie Blythe, and “Chanson d’Avril” with Nicole Cabell. He was also featured in a “Live from Lincoln Center” national broadcast on PBS with Stephanie Blythe in April 2013. CLICK HERE to purchase tickets to see Eric Owens and Craig Terry on April 15! For 40 years, Charlottesville Opera has been curating high-quality opera and other musical performances for the Charlottesville community, starting out at Ash Lawn-Highland and now on stage at The Paramount Theater. We have been thrilled and honored for the past 8 years to have been the gathering place for these incredible productions, and we are excited to partner with the transformed (and still very beloved) Ash Lawn Opera to announce its 40th season, now as Charlottesville Opera. 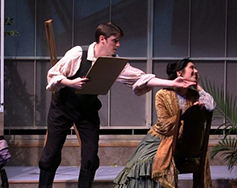 Charlottesville Opera – the recently renamed Ash Lawn Opera – is excited to present the East Coast premiere of Middlemarch in Spring, a new chamber opera based on George Eliot’s Middlemarch, in March of 2017. Written by the creative team of Allen Shearer, composer, and Claudia Stevens, librettist, this will be the company’s first premiere in over 35 years. The world premiere of this delightful new work was hailed as one of the top 10 operatic events of the year by the San Francisco Chronicle, as well as one of Encyclopedia Britannica’s most noteworthy new musical works of 2015. The production is presented in partnership with the Virginia Festival of the Book, which will be held in Charlottesville from March 22-26, 2017. Ticket holders are invited to hear pre-performance talks one hour before each performance, by librettist Claudia Stevens on Thursday, March 23 and by Rebecca Mead, staff writer for The New Yorker and author of My Life in Middlemarch, a personal account of the novel’s importance in Mead’s life, on Friday, March 24. 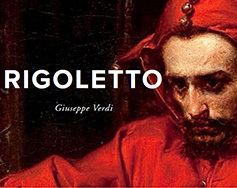 One of the greatest works in the operatic canon, Rigoletto tells the tragedy of a father whose fervent attempts to protect his daughter from the dangers of the world cause her ruin. Featuring several incredibly popular arias, Verdi’s depiction of the machinations and scandals of a sixteenth century Italian court remains haunting and all-too-relevant today. The cast stars fan-favorite Hyung Yun (Metropolitan Opera) as the title character. Yun was most recently seen with Charlottesville Opera as Germont in La Traviata (2016), co-produced with The Oratorio Society of Virginia, and as Sharpless in Madama Butterfly (2015). He will be joined by Ashley Emerson (Metropolitan Opera), praised by Opera News for her “musical energy, immaculate technique and physical grace”, as Rigoletto’s beloved daughter Gilda, and Matthew Vickers (Virginia Opera) as the caddish Duke of Mantua. 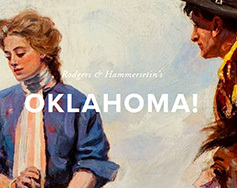 Charlottesville Opera’s 40th season concludes with Oklahoma!, the very first collaboration between composer Richard Rodgers and librettist Oscar Hammerstein II. Set in the Wild West at the turn of the century, this charming and heartfelt musical portrays the rivalry between a small town’s farmers and cowboys, which is brought to a head by the romance between Laurey, an earnest farm girl, and Curly, a rugged cowboy. Oklahoma! is a special collaboration between Charlottesville Opera and the Charlottesville Ballet, Charlottesville’s only professional dance company, to bring the musical’s rousing dance numbers to life. Jennifer Zetlan (Metropolitan Opera), whom the New York Times described as “a radiant, agile voice and excellent control,” stars as the charming farm girl Laurey. Tenor Nathan Granner (Opera Theatre of St. Louis) plays her star-crossed lover, Curly. Sharin Apostolou (Glimmerglass Festival) returns to Charlottesville Opera for a third consecutive year following her triumphant portrayals of Eliza Doolittle in My Fair Lady (2015) and Nellie Forbush in South Pacific (2016) as the flirtatious Ado Annie. Charlottesville Ballet is proud to include choreography by CB Artist Mary Hein, three professional soloists, and a student ensemble. Featuring beloved songs including “Oh, What a Beautiful Mornin'” and “People Will Say We’re In Love,” this classic musical will delight adults and children alike. CLICK HERE To Purchase Tickets to Oklahoma! New York, NY (March 12, 2017) – The Met: Live in HD’s Saturday, March 11 transmission of Verdi’s La Traviata took in an estimated attendance of 84,000 in North America, earning a gross of $1.8 million. It was seen live on more than 900 screens. An estimated additional 125,000 people saw it live on 800 screens in 37 countries in Europe, 11 countries in Latin America, Russia, Egypt, Israel, Jamaica, and Morocco. Delayed showings throughout Asia, Australia, Madagascar, New Zealand and South Africa, and encore performances in North America and Europe, are expected to boost worldwide attendance of La Traviata to more than 330,000. The encore screening in the U.S is on Wednesday, March 15; encore screenings in Canada are on April 15, 17 and 19. One of the best-loved operas in the repertoire, La Traviata starred Sonya Yoncheva as Violetta, Michael Fabiano as Alfredo, and Thomas Hampson as Germont. The acclaimed production by Willy Decker was conducted by San Francisco Opera Music Director Nicola Luisotti. The live transmission was hosted by mezzo-soprano Isabel Leonard and directed for cinema by Matthew Diamond. The Met: Live in HD, the Met’s award-winning series of live transmissions to movie theaters and performing arts centers around the world, has expanded its worldwide distribution to more than 2000 theaters in 71 countries this season and has sold more than 22 million tickets since its inception in 2006. 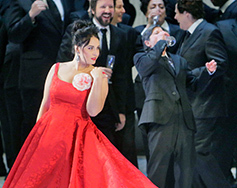 La Traviata was the seventh of ten live transmissions to be shown this season. The next transmission will be Idomeneo, Mozart’s first operatic masterpiece, on Saturday, March 25, conducted by Music Director Emeritus James Levine. The Paramount Theater has been nominated for the Daily Progress 2017 Readers’ Choice Awards! The Paramount Theater is very excited and honored to have been nominated in the Best Nonprofit, Big Show, and Intimate Show subcategories. The winners will be announced in April 2017. We would also like to extend our congratulations to several of our wonderful sponsors who were also nominated – including but not limited to: Northwestern Mutual (Financial Services Category) and Carpet Plus (Home Favorites Category) – as well as our House Photographer, Rob Garland Photographers! 5% Donation Rate on Amazon Smile – One Day Only! Thursday, March 16 is your chance to give a little something extra to The Paramount! To celebrate their #1 ranking in customer satisfaction by the ACSI, Amazon will donate 5% (10 times the usual donation rate) of the price of your eligible AmazonSmile purchases to The Paramount Theater of Charlottesville on Thursday, March 16. Your consideration while you shop is greatly appreciated. Because ticket sales cover only 50% of operating costs for the non-profit 501(c)(3) Paramount Theater, every gift counts – and we thank you in advance for choosing The Paramount on Amazon Smile! For more information and to get started on Amazon Smile, CLICK HERE. Want to make another gift to The Paramount? CLICK HERE to donate! In addition to our National Theatre Live in HD performances, The Paramount is also proud to offer the Met Live in HD series. 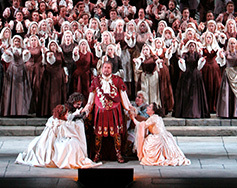 Similar to NT Live shows, Met Live in HD performances are broadcast live from the Metropolitan Opera in New York City. Past performances include Wagner’s infamous Ring cycle, the classic Tristan and Isolde, and the ever-popular Madama Butterfly. These stunning performances are broadcast right from the Met’s stage, and have been a favorite of The Paramount’s opera-loving community since the first broadcast at the Theater in 2008. 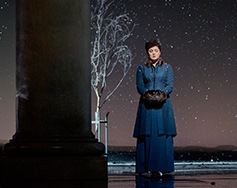 Tchaikovsky’s setting of Pushkin’s timeless verse novel is presented on the Met stage in Deborah Warner’s moving production, starring Anna Netrebko and Peter Mattei* as Tatiana and Onegin. Alexey Dolgov sings the role of Lenski, and Robin Ticciati conducts. Tickets to these events are $18.00 for students, $22.00 for seniors, and $24.00 for adults. Check back on The Paramount’s website and sign up for our newsletter to stay in the loop on all things Met Opera, including show announcements! Win Two Tickets to Paramount Presents: Rosanne Cash on March 9! We can’t wait to welcome Grammy winner Rosanne Cash to The Paramount’s stage on Thursday, March 9 at 8:00PM – and to share our excitement, we are giving away two tickets to the show to one lucky winner! Entering is easy – all you have to do is visit our Facebook page and share the below post, and we will select a winner on Wednesday, March 8. Singer-songwriter Rosanne Cash, a Nashville Songwriters Hall-of-Fame inductee, will play songs from her acclaimed album The River & the Thread. Written by Cash and her husband and collaborator, John Leventhal, The River & the Thread garnered three Grammys in 2015 including Best Americana Album, Best American Roots Performance, and Best American Roots Song. Her soulful style is an ode to the American South and often tell stories that portray the spectrum of the human experience, from a Civil War soldier to a present-day couple in Alabama. Learn more about Rosanne Cash here. The Paramount is pleased to offer our audiences an alternative screening option for some events that will provide a positive viewing experience that is welcoming to all individuals, but those specifically with sensory sensitivities. We first offered this viewing option during the holiday season with a sensory-friendly broadcast of The Polar Express! Because of the excitement and overall request for The Paramount to offer more events, like this, we are pleased to say it will become a part of our programming objectives. What exactly does it mean when a movie is “Sensory-Friendly”? Audience members will be welcome to enter and exit the theater as needed. There will also be a space to walk and move around easily in the lobby. When possible, there will be a quiet room on located on the fourth floor for those who need to take a break from the film. 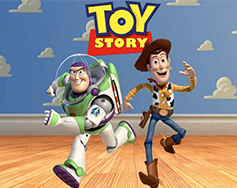 Join us for a sensory-friendly screening of Disney’ Pixar’s Toy Story [G] this Sunday, March 5 at 11:30AM. Tickets are available here. For more information, please call the Box Office at 434.979.1333. Thank you to UVA’s Autism Theatre Project for partnering with The Paramount to create a positive experience for our sensory friendly screening of Toy Story. Open Captions – Tell Us What You Think! This year, we are excited to roll out several new initiatives to make it easier for our patrons to tell us what they think and what they would like to see at the Theater – specifically using surveys! Last week at Decades Entertainment’s presentation of Decades Rewind, we were happy to receive great feedback from patrons, including a request to make available films with open captioning. This feedback is important to us, and we are proud to say that The Paramount has previously offered many captioned movies such as Titanic, Big, and Slumdog Millionaire. We would be equally proud to offer more captioned films like this in the future! In the spirit of gathering patron feedback, we would like to ask for your suggestions on which films should be shown with open captioning. Tell us what you’d like to see! Email us at info@theparamount.net, call us at 434.979.1333, or message us on Facebook, or in our live chat feature on www.theparamount.net. Additionally, don’t forget to fill out our surveys, which will be available in the playbills at all of our performances; in the upcoming newsletters which will be mailed to supporters and displayed in the Box Office; and at our feedback podiums in the Lobby and first floor of the Theater. Your feedback is always welcome and appreciated.